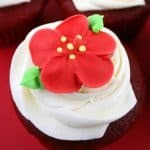 Red velvet cupcakes with buttercream frosting and a pretty fantasy flower made of royal icing on top. 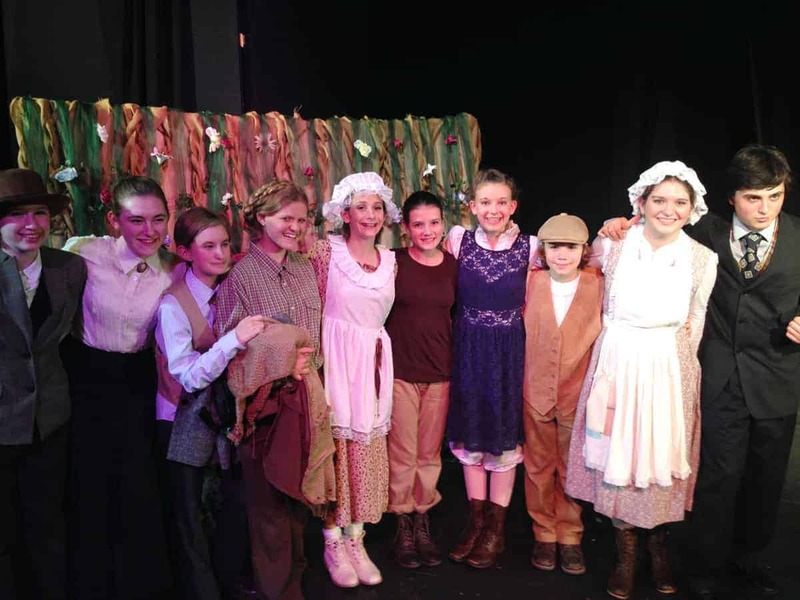 For the last 2 weekends, my daughter was in the ensemble cast of Performing Arts North’s production of The Secret Garden. These are the cupcakes I made for the cast party. I know they look kind of Christmasey, but a red flower was a significant part of the play. You can make the flowers any color you want. The flowers are actually the first thing you make because they need to dry for at least 8 hours and preferably overnight. 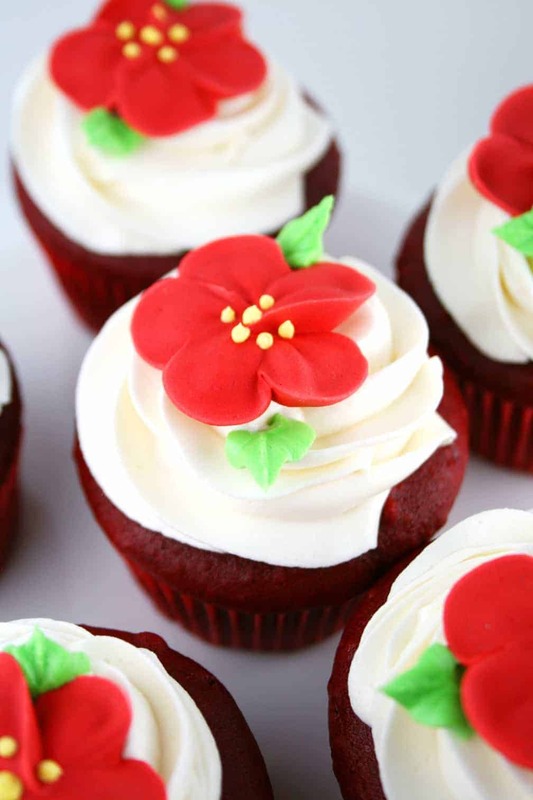 Make your royal icing and add red food coloring (after you reserve 2/3 cup icing for the yellow centers and green leaves). Fill a pastry bag fitted with a 104 pastry tip with red icing. 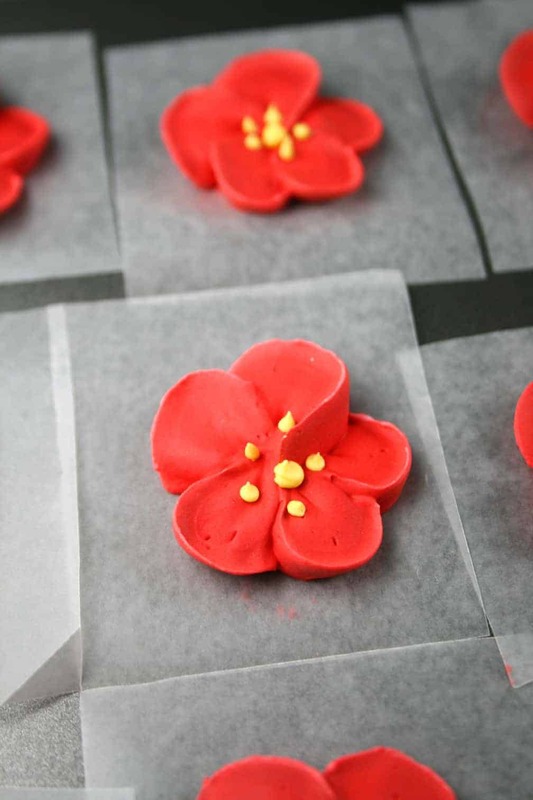 Using a pastry nail and a small wax paper square, pipe your 5 petal flowers onto the paper. It’s easier if you watch the video here. (Thank you to my sister, Best, for the superb video camera work.) You can pipe the yellow centers later. 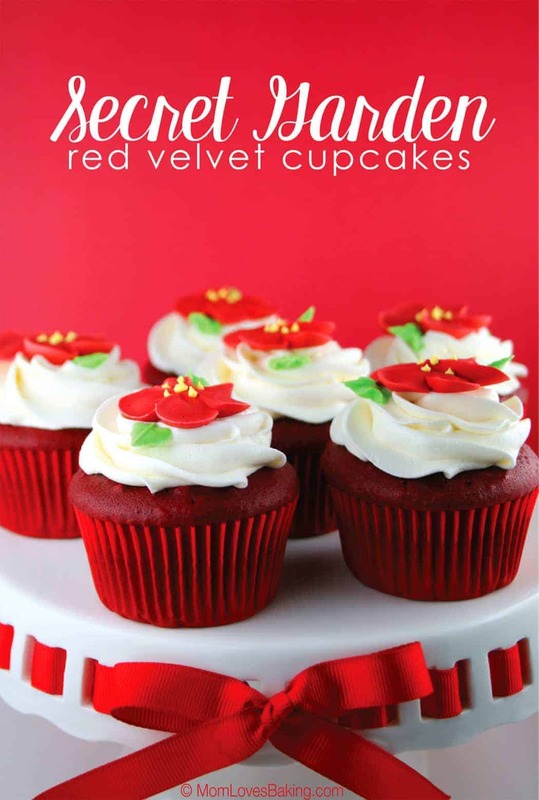 I’ve tried so many red velvet cake recipes and haven’t been able to find one that I really like. That’s why I used a mix. This one is Duncan Hines. If using a cake mix, I think it’s important to have a homemade frosting. 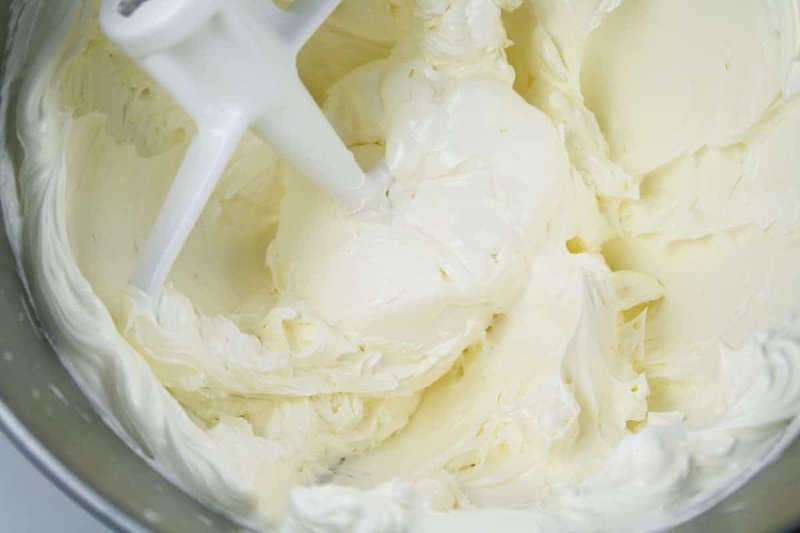 I posted this basic buttercream recipe before. It’s and oldie but goodie. This photo shows the butter after it’s been beaten on Medium speed for 3 minutes. It’s always amazing to me how fluffy it gets. Just butter, nothing else so far. Then you add the confectioner’s sugar, cream and vanilla. And beat for 3 more minutes. Fluffy and delicious. I used a #2.5 pastry tip with yellow royal icing for the dots on the flowers and a #352 pastry tip with green royal icing for the leaves. Aren’t they lovely? And I finally got to use my cakestand with the red ribbon. I know I can change the ribbon but I guess I’m lazy like that. Speaking of lovely, here’s a photo of most of the cast from the play. My girl is in the middle with the brown top. They all did a wonderful job and I’m pretty sure they liked the cupcakes. Check the Performing Arts North website for their latest production at the Dancing Goat Theater. 3 disposable decorating bags I used Wilton 16"
1 disposable decorating bag I used Wilton 16"
Place sugar, meringue powder and water in a large bowl. With an electric mixer on low speed, beat for 6 minutes. Immediately transfer to an airtight container or cover bowl with a damp cloth. This icing will dry out quickly. Before making the flowers, take out 2/3 cup of icing and place in an airtight container (for the flower centers and leaves later). 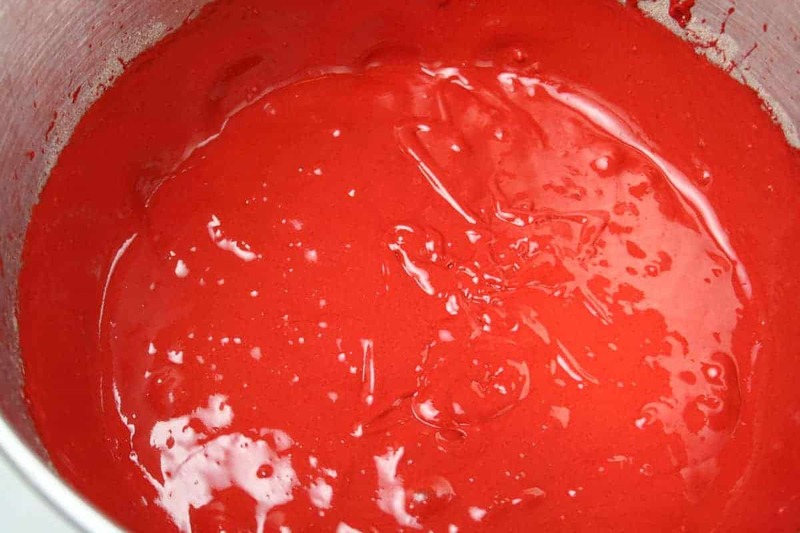 Add red food coloring to the icing and mix. 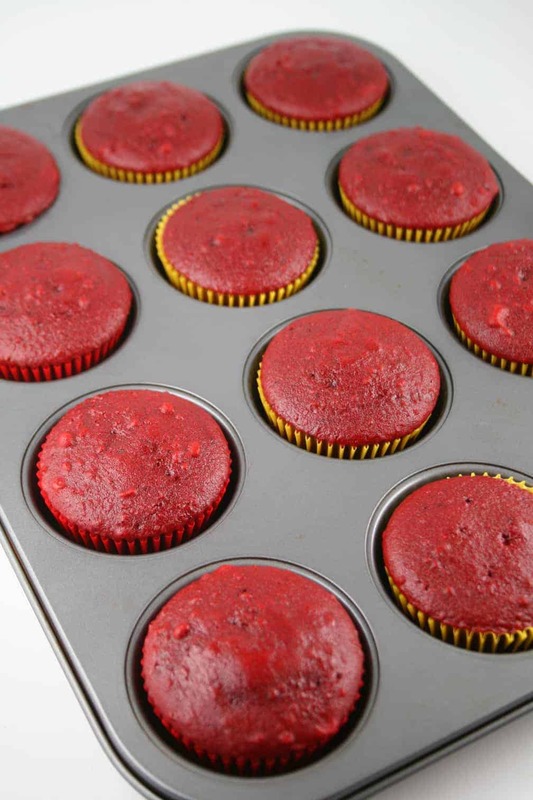 I used a whole jar of Wilton No-Taste Red Food Coloring. Cut 24-30 (2"x2") squares out of waxed paper. 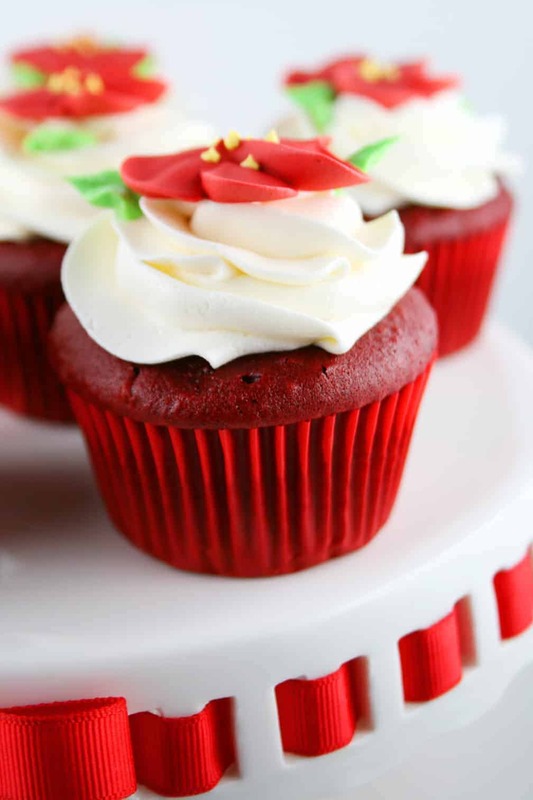 Fill a decorating bag fitted with a #104 tip with red icing. Place a little icing on a flower nail, then place a waxed paper square. Pipe a 5 petal flower. Place on cookie sheet to dry. Repeat. You should have enough for 24 flowers. 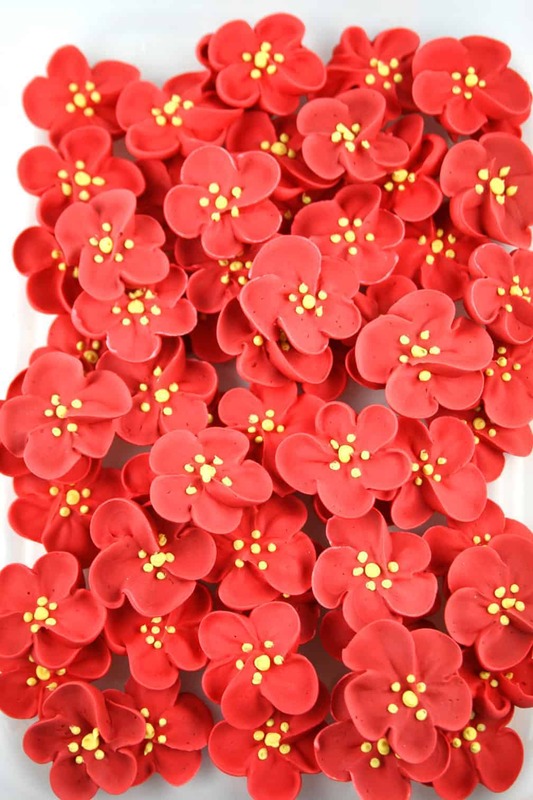 Let flowers dry for at least 8 hours or overnight. Make the cupcakes according to the cake mix package instructions. Let cool. Place softened butter in a large bowl. With an electric mixer, beat on medium speed for 3 minutes. 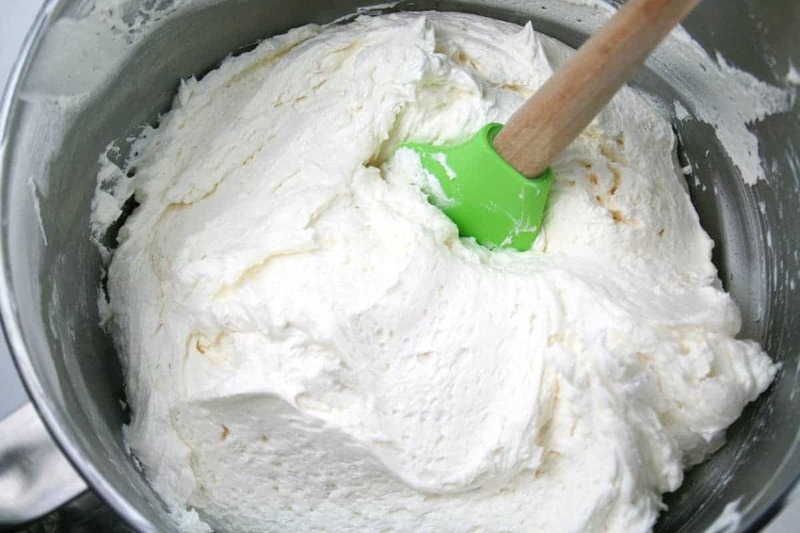 Turn mixer down to low and gradually add sugar, cream and vanilla. Turn mixer up to medium and beat for 3 more minutes. Place 1/2 of the buttercream in a pastry bag fitted with a #1M tip (refill bag when needed). Pipe buttercream onto cupcakes in a circular swirl pattern (like soft serve ice cream). 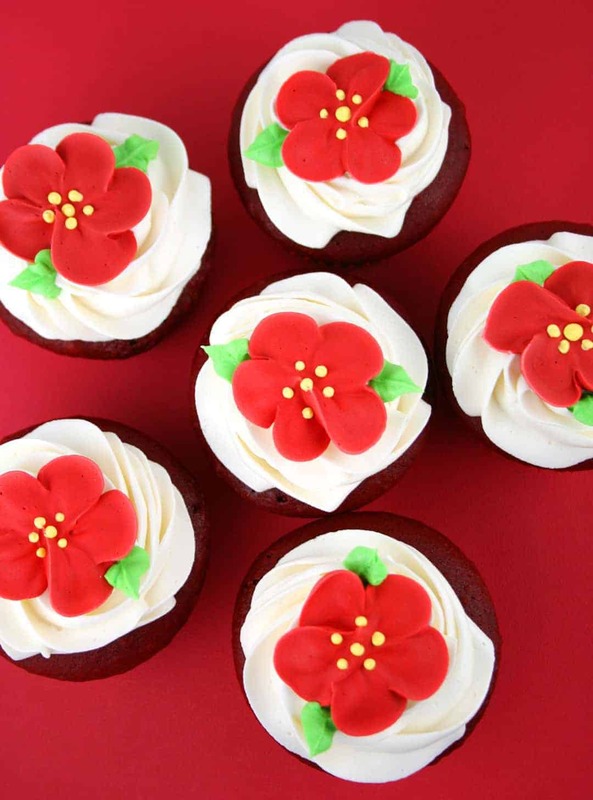 Place a dried royal icing flower on each cupcake. Using the remaining royal icing, color half green and the other half yellow. Place the green icing in a pastry bag with a #352 tip and the yellow icing in a pastry bag with a #2.5 tip. Pipe 5 yellow dots in the center of the flowers. Pipe a green leaf on each side of the flower.